With new opportunities and projects that are currently in progress, I decided that it was time to shake things up with my blog. I hope you enjoy the clean, simple and fresh new look of Kitana's Closet! And for a little update, I have many exciting things in store for this Summer, which I will soon get to share with all of you. I'm still not quite certain where all of this will lead, but humbled for the opportunities and grateful for the support that I have received so far. As for now, here is yesterday's look. You can never go wrong with classic black and white. And to style it for summer, I chose black and white pieces that were both light and airy -- a flowy chiffon skirt, and white button up top. 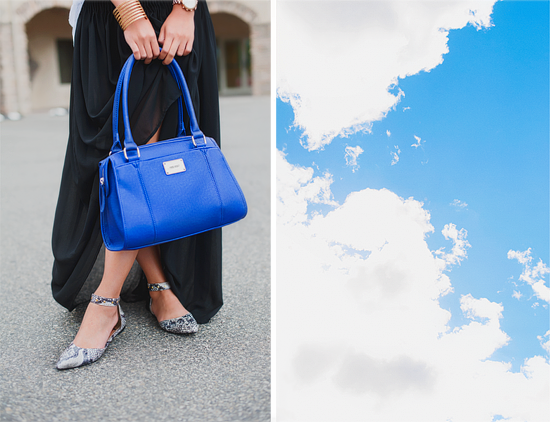 To turn classic into trendy, I accessorized with pointed-toe flats in snakeskin, and my bag and aviators gave it a splash of cobalt. While mum was snapping pics of me, dad took my little brother out for a little exploration on the river, which was right across from this beautiful Mediterranean building. After the shoot, we took a stroll down the river path and ended the night dining at our favorite Thai restaurant. Locals, if you enjoy Thai food, Mezzo Thai is definitely the best in town! I hope everyone had a lovely weekend, and I would love to hear your thoughts on this look!